LEXINGTON, Ky. (Nov. 8, 2018) — Tuesday, Nov. 6, was a big night in United States politics. Americans headed to the polls to cast their ballots for the 2018 midterm elections. Voter turnout appears to have significantly surpassed previous midterms, but final numbers have yet to be released. UKNow: Our country has become increasingly polarized — especially the political dialogue. Based on voter turnout, did that dialogue translate into action on Nov. 6? Voss: "Turnout spiked, and that groundswell of voters worked to polarize the political system even more than it was before. Three relatively moderate Democrats and one moderately anti-Trump Republican lost their seats in the U.S. Senate, while the shift in House districts accentuated the divide between wealthy and urban America, increasingly Democratic, and small-town and rural America, overwhelmingly Republican." 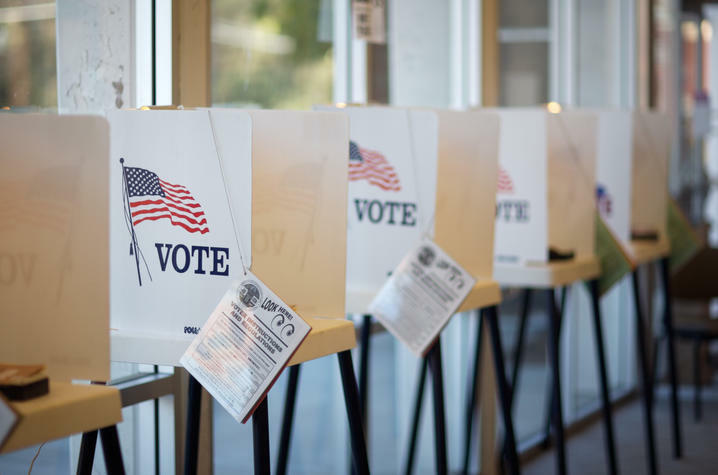 UKNow: In your opinion, what drove more voters to the polls? Voss: "Campaigns used to motivate voters by fielding attractive candidates that most citizens could support, even if they might prefer the other side. The candidates being offered to voters these days tend to be more ideological, more extreme — and as a result, voters increasingly say that they’re showing up to stop or oppose the other side. The rising turnout we see is not a sign of healthy democracy, but instead a sign of how much American partisans increasingly despise each other." UKNow: The race between Andy Barr and Amy McGrath was a Kentucky race, but why did it play out on a national stage? Voss: "Outside observers viewed McGrath’s campaign effort as a daring experiment, one that could blaze a path for how future Democrats might be able to swing low-income Republican territory. Her military background and Republican spouse gave her credibility when she promised to be an independent voice rather than a partisan in Congress, and she knew how to approach traditional topics like guns and family in a way that felt familiar to small-town and rural voters. Sadly, people focus on outcomes more than on vote patterns, so the fact McGrath lost may mean that that fewer candidates in 2020 try to repeat her approach. But unlike in many places around the country, the turnout here likely did include a lot of voters excited by McGrath herself rather than just about stopping Trump. Despite being a novice candidate, she came close to unseating a three-term Congressman, and she cut into the Trump vote all over the district. I do not see how any fair observer could call the McGrath campaign a failure. The experiment worked." UKNow: Barr narrowly won the Sixth Congressional District. What kind of message does it send that Barr was re-elected, but not by a landslide? Voss: "Usually when a member of Congress survives a trial by fire like this one, he’ll be safe for a while (although I can think of exceptional cases in which districts are competitive year after year). So, the contest sent a positive message to Andy Barr: even in the tough years when a lot of districts are ready to abandon the GOP, we’ll keep you on. Again, though, people may be tempted to draw the wrong message from Barr’s victory and view it as resulting from Donald Trump. It is true that President Trump visited the district and tried to mobilize his core supporters on Barr’s behalf, but normally a candidate like Andy Barr never would have been in trouble in a district like this. Barr only found himself in trouble because of the opposition that his party has been stirring up due to Trump’s unpopularity." UKNow: Nationally, Democrats flipped the House, as the GOP expanded the Senate majority. How will this shape the rest of President Donald Trump’s first term? Voss: "Donald Trump will continue to be able to reshape the federal judiciary away from the direction in which President Obama took it, because of this stronger GOP Senate majority. However, passing legislation bills now requires going through the Democrats in the House. That will not matter for most bills, because Democrats already had the power to stop legislation using the Senate filibuster rule. It will matter on tax and budgetary bills which used to be able to bypass the Senate Democratic minority but now will need active support from House Democrats. Also, I expect that Democrats will use their new perch in the House, and the resources brought from leading it, to engage in rigorous oversight of the Trump administration." UKNow: When looking at the results holistically, what do they say about the direction of our country? Voss: "Sadly, what they say is that unless the nation experiences some kind of crisis that pulls us together, we can expect polarization only to worsen in the next couple of years."